We are so much more than just paper and pens! Our catalogue has been designed to give you the most relevant information possible so that you can make the correct choice, first time. Whatever your needs, don’t worry, over 16,000 office supplies products are available for next day delivery offering you quality, reliability and great value with 100% satisfaction guaranteed. We provide a comprehensive range of general office supplies from all the best known manufacturers plus a further choice from our own 5 Star range. The extensive portfolio of our 1,600 5 Star products are available in 2 tiers to meet different business needs offering you the best value with a quality you can trust. 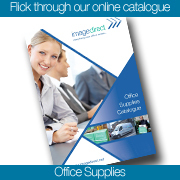 Our extensive range of office supplies offers you “everything your office needs” and products to cater for specific customer needs such as our graphic supplies and specific legal products, keeping your business running smoothly without a hitch.